Today Bank Nifty again opened higher at 22154 and declined sharply just after opening to register day’s low 21814 but bounced again by more than 200 points to register all time high 22276 and finally closed 188 points up at 22242. Yesterday, 21822 was the reversal point and stoploss for longs taken in range 21482-21396. Bank Nifty opened above new high and registered new life time high 22276. Now, we need to analyze latest chart to find next move. Same, wave (3) of (V) may be completed at 21697, wave (4) may be completed at 21386 as Irregular Correction and wave (5) may be running. Minimum 38%-61% projection for wave (5) is at 22033-22432. Thus wave (5) achieved minimum target 22033 and next possible target is 22432. Wave (5) achieved its minimum projection and now we need to analyze the progress of wave (5) started from 21386 on separate 15 Min chart to check the pattern. This is 15 Min chart of Bank Nifty showing bounce from 21 Apr 2107 low 21386 which is the start of wave (5) on previous chart. 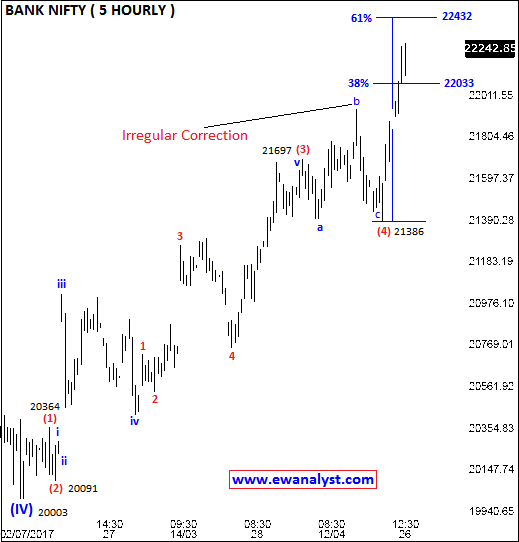 Inner waves of wave (5) are not clear but steep bounce till 22250 may be the end of wave 3 and wave 4 may be completed from 22250-22108 as an Irregular Correction and wave 5 may be in progress. Minimum 38%-61% projection for the wave 5 is placed at 22438-22641 which is next expected target range for upside. 23%-38% retracement of wave 3 is at 22046-21919. 38% retracement 21919 is the reversal point and stoploss for longs. Bank Nifty bounced sharply as expected and trade is already giving 600-800 points profit. Bank Nifty is registering new life time high every day but still there is no sign of reversal and Bank Nifty still have possibility to bounce further. 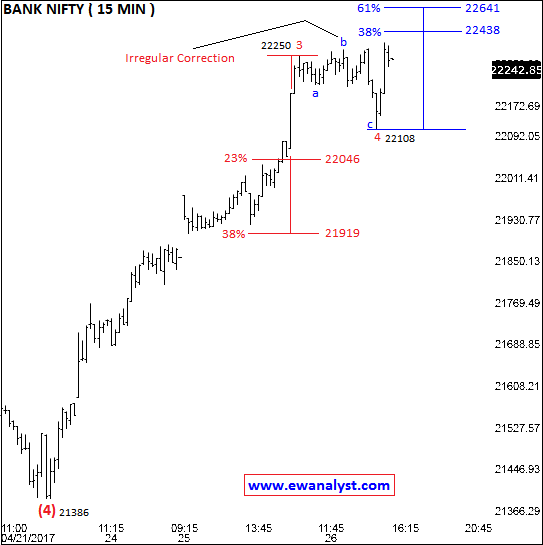 Next possible target range of Nifty for upside is 22438-22641 and 21919 is the reversal point and stop loss for longs. Bank Nifty longs taken in the range 21482-21396 (part profit booked at 22043) can be hold with fresh stoploss of 21889 (some points below 21919) for further targets 22438-22641. For Fresh Trade, Bank Nifty if decline towards 21950-21919 can be bought again using stoploss of 21889 (some point below 21919) expecting minimum target 22438-22641. Banknnifty too over bought and axisbank result is weak. Got some clarity on this time again. Very Much Thank you Vinod sir.